With large, easy-to-read LCD or LED displays, CS1500™ high performance crane scales are available in a range of capacities from 500lb (250kg) to 20,000lb (10,000kg), are NTEP certified, and boast best-in-class battery life. Our advanced design, value-packed with the industry’s most desired features, makes Intercomp the first choice over other electronic units. Ultra high-resolution, A/D conversion delivers unsurpassed accuracy, and digital keypad setup and calibration enhance the ease of operation. All crane unit electronics are shock-mounted in a weatherproof case and provide maximum protection against moisture, dust and rough usage. Features include a high-visibility digital readout for easy reading of weights and large pushbutton switches for simple, trouble-free operation. 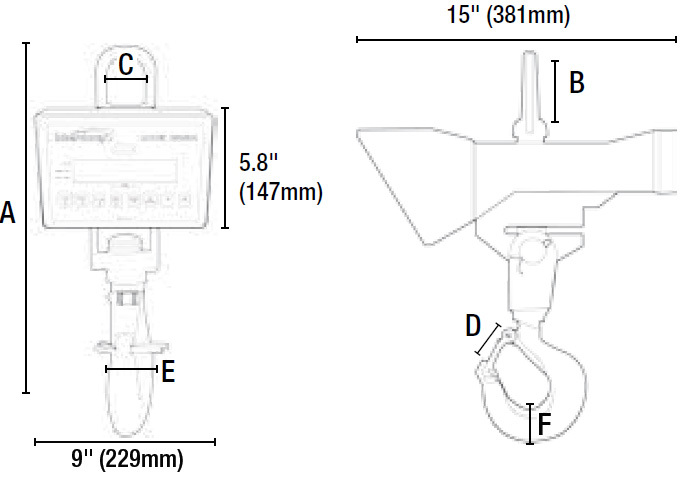 Low-cost, high performance digital crane scale for medium capacity industrial applications. The unique design flexibility lets you choose the model and weighing capacity you need - NTEP certified from 300 to 20,000 lb/150 to 10,000 kg. The unit utilizes a high-visibility 0.8 inch/20 mm LED digital readout and the efficient micro-controller delivers up to 100 hours of operation on eight (8) D-cell batteries. Crosby eye hook and bottom swivel hook.